Gray polyester shades bring a stylish look to this triple shade pendant light. This appealing triple shade pendant light offers a great contemporary look for your home decor. The brushed nickel finish frame features graceful curving arms that lead down to three designer gray polyester shades that are expertly hand-assembled by artisans in our California workshops. White acrylic diffusers to help eliminate glare, making this fixture a great choice for dining rooms, entryways, and seating areas. 36" wide x 23" high x 65" maximum overall hanging height x each shade is 14" wide, 5" high x includes one 6" and three 12" downrods. Sloped ceiling adaptable. Uses six maximum 75 watt or equivalent bulbs (not included). Contemporary style triple shade pendant. Brushed nickel finish; white acrylic diffusers. Hand-assembled shades; gray polyester shade material. Looks beautiful and will do well in my living room. 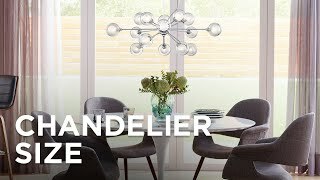 Should match the grey in my dining room and the brushed nickel will match my other awesome lamp purchase from lamps plus! What is diameter of ceiling mounting plate? 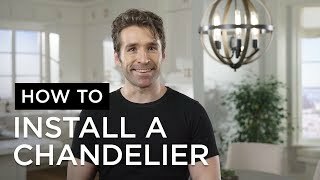 How much pounds is this light fixture? BEST ANSWER: Diane I think it’s listed on the item specs but it wasn’t that heavy - was easy enough to hold in place while wiring and once we had the ground attached it just hung there while we did white and black wires. It’s very pleasing to look at and can be tilted if your ceiling or mount isn’t straight. I'm not sure exactly. Light enough to hold it with on hand while I installed it. We really Like it. Is it possible to order additional shades so that we can switch them out seasonally? May I order and pay for this and have it delivered on a specific date? Or at least not before that date? Can LED bulbs be used in these lights? Yes, there are two bulbs per shade so 6 LEDs are needed. Are the three drums open at the top so there is up lighting and downlighting? BEST ANSWER: Hi - This does not feature a top diffuser and it is open at the top. But, it does include a bottom diffuser. 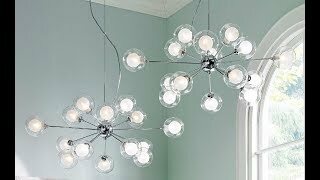 I am considering buy this fixture with three similar style Rossini ceiling lights Style # 9K753. Are the gray faux silk shade made from the same material and exact same color? BEST ANSWER: Hi - Yes, they are both from the same collection and the shades will match. 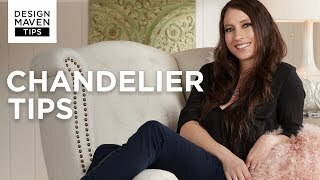 Does this chandelier come in a bronze finish? BEST ANSWER: Hi - I am sorry, this is not offered in any other finishes. Does this fixture also come with a single shade rather than the three shade option shown? BEST ANSWER: Hi - I have added some options below you may like. How does this item work on a cathedral ceiling? Do not see any chain to level it, only a straight rod. Want it for over dining room table. BEST ANSWER: Hi - this is slope adaptable up to 45 degrees. Good news. This would work for a sloped ceiling over table then? Want to be sure. Also need entry light to correspond with this. Also on slope. Can you help? I installed mine on a slopes ceiling. There is a standard chandelier ball and socket that allows the downrod to hang naturally to vertical. Thank you. Glad to know. Have gotten several conflicting answers. The rod pivots to set the light straight. BEST ANSWER: Hi Richard - This has a 65" maximum overall hanging height. Based on the length of the downrods, can this fixture work in a home with ceilings higher than 12 feet? BEST ANSWER: Hi - with an adjustable overall maximum hanging height of 65", it can work for a 12 foot ceiling. Depending if going over a table and the table size, you may need a different size. 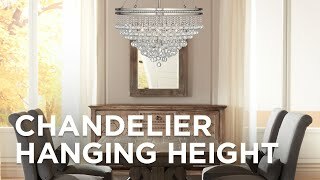 Please feel free to contact one of our knowledgeable Lighting and Home Décor Specialists who can provide you with some fantastic advice on chandelier/pendant sizing. I have also added some helpful links below. Does this come in a cream faux silk? BEST ANSWER: I have added the option below. 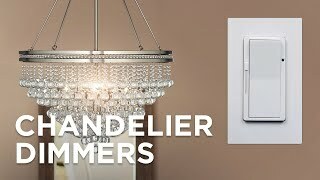 Could this light fixture adapt to a dimmer switch? I have it on a dimmer, select your bulbs according to this use. 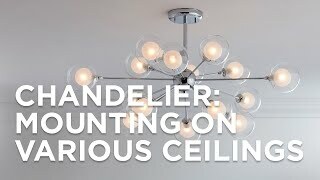 Can this fixture be used on a slanted/sloped ceiling? BEST ANSWER: Yes, the chandelier can be installed on a sloped/Vaulted ceiling. I was told this could not be installed on a sloped ceiling. I have cathedral ceilings and I wanted to install over dining room table that is 38x72.. Is there a chain that has to be used to level this? Otherwise how does this work? Hi - This has a swivel mechanism at the top which allows it to be slope adaptable. BEST ANSWER: The height does not include the rod pictured. Unfortunately, the unit cannot be installed without the downrods. You need to use at least one rod, 6" or 12" inch. Can this one use LED to make it seem very bright? I'm considering it for a kitchen that is small, maybe 12' x 13'. & has a 10' ceiling. BEST ANSWER: Yes, you can use LED bulbs in this fixture and select the color temperature that suits your needs best. 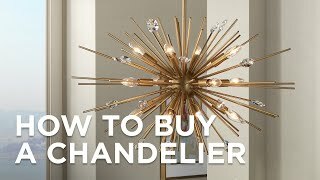 Generally, when selecting a fixture for the center of the room, you want to add the dimensions of the room. For example, your room measures 12 x 13 feet. Therefore, you would add 12+13 = 25. You should be selecting a fixture that is approximately 25" wide for the center of the room. This fixture measures 36" in width and may overwhelm the room. I would be concerned with that high ceiling. Depends on how low you drop it and how bright you want the light to be. I have the recommended wattage and LED bulbs and it is not overly bright. I've got it in an eight foot ceiling room over a long dining room table. The light is especially neat when dimmed. does this have gold on it too or is it just the light shining? BEST ANSWER: This lamp has no gold finish on it, it's just the light shining like you say. No gold. Very silver and gray. Classy look. The light is gorgeous!!!!!!!! I am over the moon happy about it! I love the size of this. We have a large round table and it’s perfect! Perfect except for crooked lamps. Love the pendant overall. Materials and fabric look high quality.Give off good light especially with a dimmer. It's just that each individual lamp sits crooked. Annoying. I tried to bend some parts to straighten the way the shades sit but was afraid of applying too much pressure and breaking something. It helped enough to want to keep the fixture. But then again, who's going to send back a light fixture after you just spent an hour installing it? 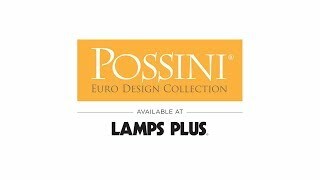 I would purchase from Lamps Plus again. Sandstone Polyester shades bring a stylish look to this triple shade pendant light.